Online shopping has now gone so deep into our lives that we cannot think of our life sans online shopping! But ,there is also one thing that confuses us , the number of options to buy your stuff from. And the problem here is that, some of the options are the “not so trusted” sites or as I would call fraud or fake websites! And in this case you need some dependable sites where you know what you are buying and the people on that end can also help you chose what you need! 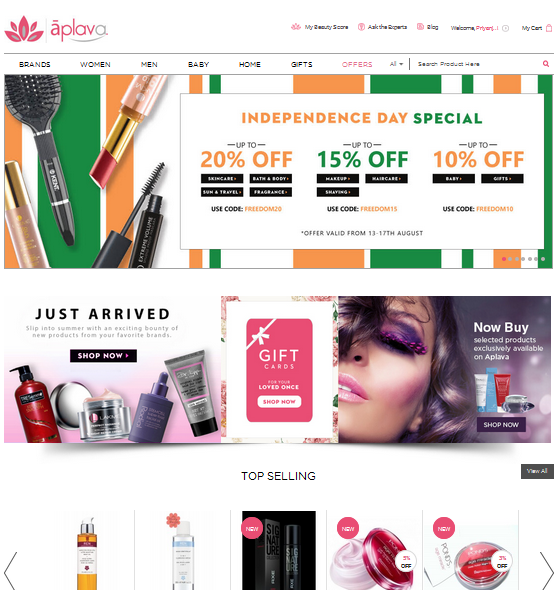 Introducing Aplava , a website which offers personal, skincare and cosmetic products DIRECTLY from the brands, across the globe! So, you won’t have any doubts about the product being a fake! They have many brands available on their website which are not available on other similar websites! So, you have loads of options! Moreover, they have this new thing which I loved, which is called “MY BEAUTY SCORE”! They do free shipping and to top it all off, the website is super user friendly and pleasant on the eye! The professional team of Dermatologists and Beauty advisers from Aplava , has cherry picked brands across a broad range of product categories including Skincare, Hair care, Bath & Body, Make Up, Fragrance, Sun & Travel, Intimacy, Shaving, Candles and Aromatherapy, Mom & Baby & Home-care(ppheewww!!). So, you can take care of everyone’s needs from this one place and be rest assured that you are getting quality products! (pssstt…. The score might help you win something this week on my twitter page!) And Make sure you follow them on Twitter!